When you have Brad Pitt starring in your movie, you don't need much else in terms of marketing it. Killing Them Softly is Andrew Dominik's anticipated follow-up The Assassination of Jesse James by the Coward Robert Ford and has an amazing cast that also includes James Gandolfini, Ray Liotta, Richard Jenkins, Ben Mendelsohn, Scoot McNairy and Sam Shephard, but the poster doesn't need much more than Pitt handling a shotgun, as evidenced by the new artwork that you can see below. The poster comes via Huffpost and you can see it full size over there. It would seem that they are pretty much aiming for the minimalist approach when putting this film out there. You may remember the teaser poster that came out a few months ago that featured nothing more than a pair of aviator sunglasses and a gun. This isn't exactly more complex. The film stars Pitt as Jackie Cogan, a mob enforcer who is brought in to find the two men responsible for robbing a mafia-run poker game. Prior to directing Jesse James Dominik helmed the Australian drama Chopper, which not only put his star on the rise, but also Eric Bana's. The movie premiered earlier this year at the Cannes Film Festival and will be arriving in theaters in the US on October 19th. 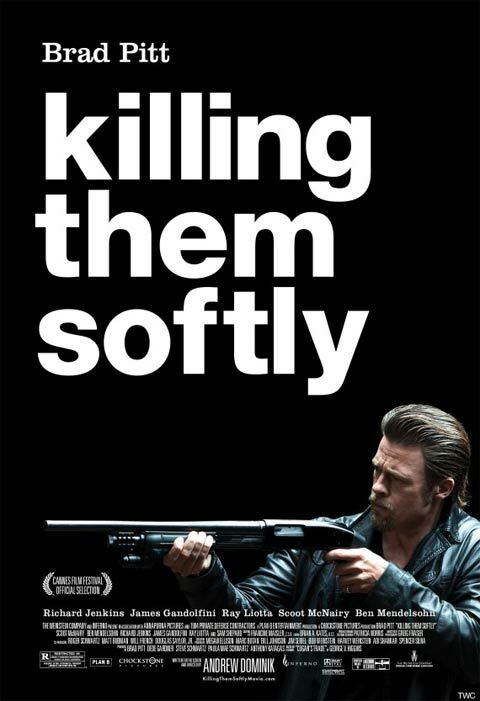 To see more from Killing Them Softly head over to our Blend Film Database.